The emperor has declared that pavilions shall be constructed among the lanterns floating on the lake for this year’s festival. Place pavilions to earn gifts from the emperor and redeem those gifts for powerful actions to make this the best harvest festival yet! 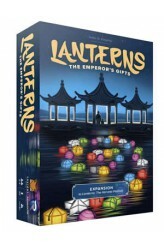 In Lanterns: The Emperor's Gifts, an expansion to Christopher Chung's award-winning Lanterns: The Harvest Festival, players start with a small supply of pavilions. When you place a tile, you may choose to build a pavilion on that tile. When you make a color match on a pavilion, you earn a gift from the emperor, a new currency that can activate special actions, as defined by emperor cards. Two emperor cards are revealed each game. On their turn, a player can redeem two gifts to activate one card and perform the s..